Join the Children & Youth Arts Program for a night of fun, food, and mystery! 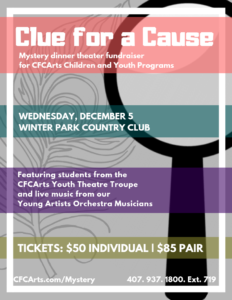 Inspired by the game Clue, this comedic murder mystery dinner party will be a hilarious short show, featuring youth actors from the Youth Musical Theatre program. Proceeds from the dinner show sponsored by Santiago’s Bodega will go towards the Children & Youth Arts Program’s youth theatre and orchestra programs for costumes and instruments. And make sure to stick around for the post-show dessert reception featuring live music played by youth musicians from the Young Artists Orchestra. Was it Mrs. White in the study with the candlestick or Ms. Scarlett in the lounge with the rope? There’s only one way to find out!